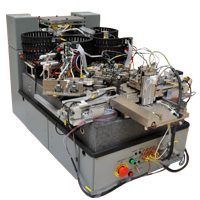 Spinstand Guzik Spinstands are designed to test Head Gimbal Assemblies (HGA), Head Stack Assemblies (HSA), Head Arm Assemblies (HAA), as well as a variety of disk media. Our spinstands and related analysis instruments are designed from the ground up to provide long term upgradability (where feasible) with the lowest possible cost of ownership. Users can utilize Guzik-supplied measurements, or develop their own customized proprietary measurements. Our spinstands provide an analysis environment free from crashes so users can focus their efforts on the measurement tasks and not on the system itself. The ultra-stable platforms are designed for recording densities of 720kTPI and features track following with residual RRO better than 7 nm, plus a high-bandwidth servo loop with typical NRRO of 0.2–0.6 nm. A typical magnetic recording test system is comprised of the spinstand and several other components. The Guzik WITE32 test environment software coordinates the system activity, and in conjunction with the Guzik RWA Read-Write Analyzer and WDM Waveform Digitizer, provides the user with a variety of measurement and analysis data. Two spinstand models are available – the V2002 for non-DTR media and the DTR 3000 for both patterned and non-DTRmedia testing. A variety of required components and accessories are available for a wide range of recording head and media types, including choices for head amplifiers, head stack assemblies, cartridges, comb loaders, chucks, spindles and shrouds.